The latest line of Wacom displays and pens promise to bridge the gap between inspiration and expression. The latest batch of Wacom products have been announced today, with the unveiling of the Wacom Cintiq Pro line of tablets and pens. Harnessing more than 30 years of product innovation and customer feedback, the Wacom Cintiq Pro promises to deliver the most natural and precise pen performance to date, one that will help illustrators, creative directors, photographers, and anyone with artistic passion to unlock their creativity. 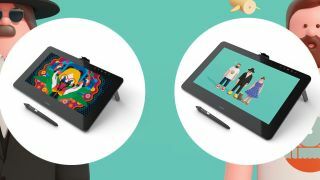 “Wacom believes in our customers’ limitless potential and we are dedicated to helping them reach their creative goals by bringing art and design to life and connecting inspiration and expression through our family of products built for creativity,” said Masahiko Yamada, President and Chief Executive Officer of Wacom. The Wacom Cintiq Pro line is made up of two new tablets and the new Pro Pen 2. As well as building on Wacom's long history of innovation, this range has been launched in response to the emerging competition in the pro designer market, with the iPad Pro and Apple Pencil muscling in on Wacom's territory, not to mention the recent launch of the Microsoft Surface Studio which looks set to shake up the way digital artists work. The main attraction of Cintiq Pro experience is the Pro Pen 2, which delivers four times greater accuracy and pressure sensitivity that Wacom's previous Pro Pen release. This improved model delivers an intuitive, free-flowing, and virtually lag-free experience that also generates just the right amount of friction. Thanks to a new optical bonding process that greatly reduces parallax, the pen-on-screen performance of the Pro Pen 2 replicates the feel of using traditional tools such as pens and brushes. As for the Cintiq Pro tablets themselves, these are available in both 13- and 16-inch models, both of which feature multi-touch that allows for fast and easy navigation. This also gives users the ability to pinch, zoom and rotate illustrations, photos and models within supported 2D and 3D creative software applications. Each tablet is fitted with an edge-to-edge etched glass screen to encourage bold pen and brush strokes. Rising to the challenge set by Microsoft Surface Studio, Wacom Cintiq Pro devices also offer flexible ways to work thanks to fully integrated pop out legs, and an optional three-position stand due in February that allows users to create in a way that suits them. “Creativity pushes artists and designers to reimagine what is possible. But for people to make the world a more creative place, they need tools that work with them and not the other way around” said Ed Neumann, Senior Vice President of Marketing for Wacom’s Creative Business Unit. Compatible with both Macs and PCs, the Wacom Cintiq 13 and 16 will be released in December and February respectively. The HD 13-inch model provides 87 percent Adobe RGB, with an RRP of $999.95/£999.99. Meanwhile the ultra HD 16 inch variant delivers 94 percent Adobe RGB and will cost $1,499.95/£1,499.99.